Of course, don’t let these brownies’ profound travelability preclude you from simply baking a batch for yourself. A Saturday afternoon seems good enough reason to us. 1. Preheat the oven to 350°F (176°C). Lightly coat an 8-by-8-inch or 9-by-9-inch baking dish with oil. Line the dish with a piece of parchment paper, allowing the overhang to drape over two sides (you can later use these flaps to lift the brownies out of the pan). Lightly oil the parchment as well. 2. In a large bowl, sift together the flour, cocoa powder, baking powder, espresso powder, and salt. 3. In another bowl, beat together the vegetable oil, sugar, and vanilla extract until combined. Add the eggs, one at a time, beating for 20 seconds or so after each addition, scraping the bowl occasionally. 4. Still beating, add the flour mixture and beat it in, being sure to pause and scrape down the bottom and sides of the bowl at least once, until the dry ingredients are just incorporated. 5. Stir in the chocolate and cocoa nibs, if using. Scrape the batter into the prepared pan and bake until the edges begin to pull from the sides of the pan and a tester inserted in the center comes out clean. This should take 25 to 30 minutes if using an 8-inch pan, 20 to 25 minutes if using a 9-inch pan. Let the brownies cool completely in the pan on a wire rack. Cut into squares and ship or serve. This was an incredibly easy recipe, yielding chocolaty, moist brownies. They were almost too moist on the first day—we managed to keep them for four days, and they continued to get better the longer they sat. Since these are called “Care Package Brownies” and need to last, the vegetable oil instead of butter makes sense. I had difficulty finding cocoa nibs, but finally found them at Sur la Table for a small fortune. The nibs do add a bit of texture and bitterness that complements sweet chocolate. My testers thought they were small pieces of nuts. The recipe took a little longer to bake than suggested, but that was the only flaw, and could have been my oven’s fault. Overall, these were everything a brownie should be: cakey, full of chocolate flavor, moist, and a little crunchy. Espresso powder, cocoa nibs—I’m always up for a sourcing challenge. Well, on this one, the recipe won the challenge, as I couldn’t find either ingredient. I ended up using instant coffee powder in lieu of espresso, and I used chocolate rice pearls in lieu of cocoa nibs. With that, I have to say that these brownies were killer. They were tender, intensely chocolaty, with a nice texture and crunch from the rice pearls. The cook time, however, should have been lengthened, as my brownies were gooey in the center. This is good for me, but not good as a care package brownie. So make sure you bake until your toothpick comes out clean! While this isn’t the best brownie in the whole world, it does deliver (pun intended) a chocolate punch. I didn’t have any cocoa nibs, nor could I find any. I kept some of the brownies around for a few days to see how they tasted. Admittedly, they were a little dry around the edges, but kept their chocolaty flavor. I’m not a brownie or chocolate person, but for some reason I thought these were the most amazing brownies I’ve ever had. Maybe it was the bittersweet crunch of the cocoa nibs, maybe the subtle espresso taste, or a combination of both. Unlike most brownies I’ve had, I could eat square after square, and it was quite hard to keep some around for the next day. Best of all, after eating them, I didn’t feel like a cement block had solidified in my stomach. This recipe is a winner. TIP: Bake them in advance, as the cocoa and coffee flavors are most intense the day after baking. I think this recipe differs somewhat from traditional brownie recipes in that it uses cocoa nibs. The brownies have a really nice flavor with the addition of the espresso granules, and the cocoa nibs add a nice crunch—a great thing for folks who don’t like nuts in their brownies. The directions were easy to follow, and cut easily once cooled. They were still moist and delicious after a couple of days, when stored in an airtight plastic container. One drawback, however, is that cocoa nibs can be expensive. Also, they’re not easily found—certainly not in a regular supermarket. This recipe yielded the perfect crackly outside, and moist, chewy inside that we love from brownies. The chocolate flavor was intense, accented by the addition of the espresso powder. I substituted additional chocolate chips for the cocoa nibs because I couldn’t find them. I used an 8-by-8-inch pan, and it gave me the size/thickness of brownie that I prefer. This is a great brownie recipe for novices, as it’s easy—there’s no butter to melt and no chocolate to temper. These brownies arrived in good condition two days after they were mailed. The tasters liked that they were somewhat flaky in texture, and not too gooey. The espresso flavor was also a hit. The cocoa nibs were not appreciated, though, with most tasters thinking they should be omitted. This would be an improvement from a practical standpoint, since I had to order the nibs online. TIP: Lining the baking dish with parchment paper made removal of the brownies very easy. I made these brownies with the intent of sending them to a friend who’s had a rough week. Of course, we had to sample them first. It turned out that we liked them so much, there wasn’t enough left to pack up—so I’ll have to make another batch for mailing. These brownies are dense, and I really liked the way the cacao nibs gave them a little crunch and, along with the chocolate chips, heightened the chocolate flavor. They were also very easy to make, and seemed to stand up well to sitting out for a few days, so I’m sure they would be great for mailing. These brownies were excellent and, as advertised, held up well after several days and several hundred miles of travel. They were so simple to make and resulted in slightly fudgy brownies with a crackly top. I mailed most of the brownies to family, but sampled one (or two) fresh brownies and saved a few to test through the week. The care package recipients and I agreed that the brownies at day five remained excellent. Note: I couldn’t find the cocoa nibs, so I added a few extra chocolate chips instead. This brownie has a rich, intense chocolate punch that peeks through its gooey texture. I personally liked the crunch from the cocoa nibs, but one of my testers didn’t. These brownies would be delicious with or without the cocoa nib addition. They also didn’t taste like coffee/espresso in the slightest. Because they’re so rich, I cut them very small, getting 25 brownies out of the 9-by-9-inch pan. They were so easy to make, and were just as good a few days after they were baked (if not better). I wouldn’t change a thing. 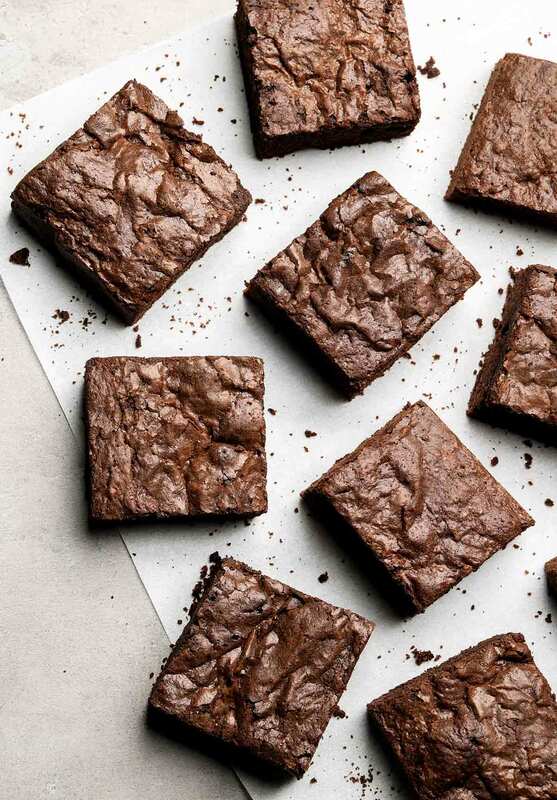 One can’t have too many brownie recipes, especially if they’re as quick to make as these. The directions are clear and easy to follow, and there are so many ways you can customize this recipe to make it your own. The brownies stayed fresh for three days (that was as long as they lasted between my husband and I), and tasted as good on the third day as they did right out of the oven. They are somewhere between cakey and fudgey, and work perfectly for brownies sundaes. I substituted chopped, roasted peanuts for the cocoa nibs, and I think any nut will work here. The chocolate chips provide nice bursts of chocolate, so don’t omit them. My brownies baked for 30 minutes before a toothpick came out with a few crumbs attached. Underbaking these brownies is preferable to overbaking them, as they can easily dry out. Next time, I’ll increase the salt a little. Care Package Brownies Recipe © 2011 Garrett McCord. Photo © 2011 Beth Price. All rights reserved. All recipes and photos used with permission of the publisher. Thanks for this recipe can’t wait to send it off to my son a soldier in the army. I’d love to see more recipes that moms can use in care packages! Michelle, I hope your son with enjoy the brownies. Please let us know. BTW, where is he stationed? Awesome brownies! I too haven’t got a clue where to find the espresso powder but I will keep looking. Is this something specific to a certain culture or it more of a gourmet thing? Maybe we could substitute with a little coffee flavoured Baileys or liquor to give it a coffee kick? I often put a shot of Baileys into my butter tarts when I make them at the cottage and there is no vanilla around, substitution can be a good thing. I have found that few grocery stores carry instant espresso, Catherine. We have had better luck at grocery shops in our area that have an Italian influnce. You could also check your neighborhood deli’s. Thanks Dan, I will check that out this weekend. We actually have an Italian bakery that carries coffees and such as well as an Italian Butcher that carries a variety of Italian cooking ingredients that aren’t too far. I will let you know/when I find it. Ellen, thanks for jumping in here with your comments and suggestions. Fantastic. Ellen, I get my nibs at Whole Foods. You can order them online, too. I highly suggest it. They are amazing in baked goods and have a smoky, musky chocolate flavor. I’ll be making a batch to go to Afghanistan. Speaking on behalf of the writer, who has his hands full at the moment researching something else in the kitchen, you’re quite welcome, kayleigh. Garret, I found these brownies while looking for a recipe that would travel to my fiance in Northern Ireland from here in Texas. Thank you, they were so easy to make. Since he loves Jaffa Cakes (little chocolate-coated cookie/cakes with an orangy jelly middle), I added some orange extract and a pinch of cinnamon to the basic recipe (there is no cinnamon in Jaffa Cakes but it helps the orange along). I used twice the amount of instant dark roast coffee powder in place of the espresso powder, replaced half the sugar with lightly packed dark brown sugar (very hard to work in by the way, I would use raw sugar for the full amount next time), and used half coconut oil/half walnut oil as the oil. I had cacao nibs on hand and used them, and a spare vanilla bean that I scraped out thoroughly. A fingerful of batter was utterly divine. The orange extract was too subtle initially but after a week in a vacuum package in a box, it will come out beautifully. I’ll follow up with a note when they’ve been in the oven a half hour. Hey speedwell, thanks for weighing in with your baking adventures! Those brownies sound pretty irresistible. Here is another tip for longer lasting baked goods. I read an academic article researching this very issue and testing different oils for longevity of freshness. They found that rice bran oil was the longest lasting. So maybe consider baking these or other baked goods to ship using rice bran oil. Unfortunately I no longer know the link to that article. Many thanks, Rochelle, for the savvy suggestion…greatly appreciate it. Found it at Piping Rock site for $6.79 for 16 ounces and Bulk Apothecary for $3.99 for 15 ounces. Hi I was wondering , how long does the brownies last for ?? Thank you, Renee. Would you know any way I could make the brownies last longer then that (like 20 days)?